Haiku About Stan Lee R.I.P. 1 AM on July 17th 1918 in a fortified mansion in the town of Ekaterinburg in the Ural Mountains, the Tsar Nicholas II, his wife the Tsarina Alexandra, their 4 daughters the Grand Duchesses Olga, Tatiana, Maria and Anastasia, and their son the Tsarevich Alexis were slaughtered by a Bolshevik firing squad. The order to kill the entire Imperial Family had undoubtedly come down from Lenin himself. But wisely he never officially wrote it down on paper. Vladimir Putin poured himself tea from the samovar. He then added lemon and honey- the Russian way of having tea- and… handling diplomacy. To Putin, it was just a day like any other. “So I suppose you’re headed to Parliament to vote yes on the non-confidence motion to bring down Theresa May’s government over Brexit,” Amadeus said as he munched tea and crumpets. Renfield smiled as he tied his tie and walked out the door. Amadeus sat frozen in position the next 5 minutes with the piece of crumpet only a millimetre from his mouth. Finally he put the crumpet down and looked at the front door of the Set mansion in a state of shock. Renfield had been yacking the past few days about the fact that if Theresa May’s government was defeated, Her Majesty the Queen might name him Prime Minister as the head of a National Unity coalition government. So why then was Renfield skipping the non-confidence vote on May’s government (when every single MP vote counted) and heading off to Oxford instead? “What,” Amadeus wondered to himself, “was so important about being at Oxford today?”. It was 50 years today that Bobby Kennedy was shot a few minutes past midnight in the Ambassador Hotel in Los Angeles only minutes after having delivered a victory speech in the Ambassador Hotel Ballroom having won the June 4th 1968 California Democratic Presidential primary. He would succumb to his wounds and die 26 hours later on June 6th 1968. And so the man who was described as America’s Last Best Hope went into eternity. Richard Nixon was elected President, the Vietnam War went on for another 7 years, American liberalism went on a downward path into insanity after George McGovern won the 1972 Democratic Presidential nomination and has been insane ever since. The insanity of American liberalism resulted in the reactionary policies of Ronald Reagan which resulted in the massive cutting of all American government programs including those that were actually helping the poor. Both Republicans and Democrats leapt into bed with the globalists from George H.W. Bush and Bill Clinton on. This was followed by the reactionism of Donald Trump that has produced a very radical and irrational nationalism with extreme racist overtones. And Bobby Kennedy the man who sought to bring all Americans black and white, rich and poor, blue collar workers and white collar workers together- his legacy the last beacon of light from the shining city on a hill. I made the following photo montage music video 10 years ago for the 40th anniversary of Bobby Kennedy’s assassination and now I post it here at WordPress on the 50th anniversary of his assassination. Haiku About Stephen Hawking R.I.P. George reached the safety of his parents’ house in time. when he died from cancer. 90 winters ago, this man was born. Haiku About Fats Domino R.I.P. This haiku is written in honour of Japanese actor Haruo Nakajima the man who played Godzilla in the first 12 original Godzilla movies that were made from 1954 to 1972. Mr. Nakajima died yesterday Monday August 7th at the age of 88. 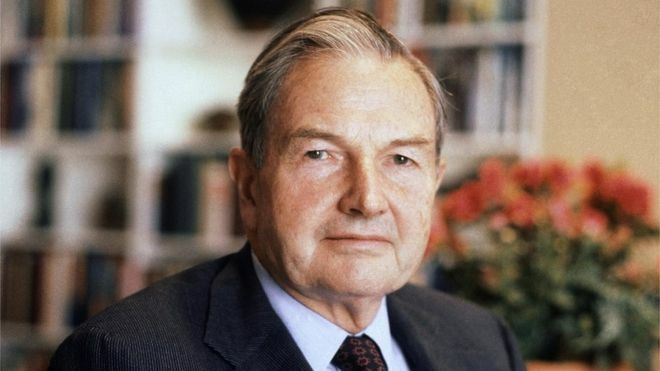 David Rockefeller founder of the Trilateral Commission kicks the bucket at age 101. Hopefully they’ll remember to bury him face downwards so that he can see where he’s going. “I noticed that,” Renfield R. Renfield commented as he fantasized about Ivanka Trump and Scarlett Johannson wrestling with one another in a wrestling ring with both women wearing evening dresses slit up the side and shiny nylon clad spiked stiletto high-heeled legs wrapped around one another’s throat. “Well, you’re obviously not too upset by David Rockefeller’s death,” Amadeus commented as he noticed the huge broad ecstatic smile on Renfield’s face. Haiku About TCM Host Robert Osborne R.I.P. Haiku About Mary Tyler Moore R.I.P.